Good evening! Another Friday is upon us. It brings promise of another summer weekend for you and yours, as well as this very community update, which we hope finds you well. There is much commotion in the studio as of late, and it is a joyous, multi-faceted commotion. Playtests for new, not-yet-revealed Halo 5 content take place each day, and we should be talking about some of that stuff quite soon. Within the next few weeks, I reckon. In the other corner of the playtest lab, Halo 5 Forge custom games on Windows 10 can be spotted, which means – ah yes – a rage quit from GrimBrotherOne is also inbound. Elsewhere, teams are preparing to bring upcoming experiences to celebrations like gamescom and PAX Prime. In this edition, Grim and myself will be talking about a variety of topics, starting with the next event on the calendar, which just so happens to be an upcoming overseas voyage. Europe’s annual celebration of all things games is truly in league of its own. Last year, gamescom 2015 saw a reported 345,000 visitors, and after witnessing it ourselves over the past few years, we can attest to the amazing scale and insanity of the operation. Even more attendees are expected this year, and we’re excited to be heading out to Köln with Halo Wars 2 in-hand. Or secured carry-ons handcuffed to our wrists. Same thing. Halo Wars 2 will indeed be playable on the gamescom show floor, on both Xbox One and Windows 10. We’ll also have some new, never-before-seen goodness for you to check out right on the show floor, and we’ll make sure some of it also makes its way to the internet for those of you who will be following the gamescom festivities from afar. 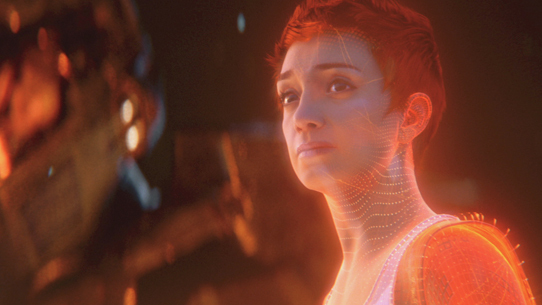 Do stay tuned, because there’s plenty of Halo Wars 2 on the way. 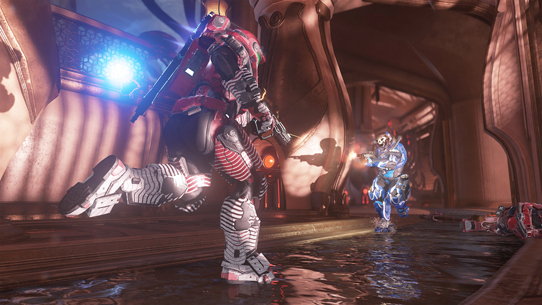 Earlier today, Triple Team Slayer – a new social playlist – dropped into matchmaking. It features three teams of three going against each other on Arena maps, and playtest results showed that it should allow for a bit more space, movement, and improved spawns when compared to four teams of three (multi-team) on Arena maps. Future iterations will also integrate objective game types, as well. As a reminder, ranked Doubles is out now, and I’ve found myself on the receiving end of a few 25-24 losses, and Tashi can confirm that they were all my fault. If you haven’t yet, be sure to jump in for the August season and see where you land. As mentioned previously, there’s more in the works as well on the social front, including more social objective offerings and new playlists. Also, we’ve been keeping a close eye on reports regarding social matching, and the services team made some updates to the Social Snipers playlist earlier this week, and have since heard that all is well. Triple Team Slayer is also running these updated settings, so matches should be flowing just as strong and smooth as your summer ale of choice. Additionally, we’ve been keeping an eye on CSR feedback, and noticed that some CSR rewards for wins were ticking up a bit too slow. This has been resolved, and the default CSR gained for wins against players at lower levels should now be a bit higher. Let us know if you see anything wacky over the weekend. Before we go, here’s a quick snapshot of the top 10 Doubles players as of this afternoon, courtesy of our friends over at Halo Tracker. As you may have hoped, the Forge team is back with a new teaser. It is also worth noting that at this point, it is believed that they only respond to emails with images and GIFs. And now, over to Grim. Thanks Brego, the past week has been pretty action packed in a variety of different ways for sure, with Halo happenings taking place in a variety of arenas. Let’s take a look at some of the biggest splashes, starting off with the epic conclusion to the HCS Pro League Summer 2016 campaign. After an incredible Summer 2016 Season full of ups and downs, rivalries and upsets, killing sprees and killer comebacks, the stage was quite literally set for the HCS Pro League NA Summer Finals. Hosted at the Novo Theatre in Los Angeles, CA, the only thing hotter than the temperature outside was the competitive Halo play inside, as drama at both ends of the field proved to provide fans with an unforgettable weekend of esports action. The Relegation Bracket saw Team Liquid and OpTic Gaming get pushed to the limit as they fought to reclaim their places in the HCS Pro League for the Fall 2016 Season against the best teams from the HCS Open Circuit. These matches saw some of the most incredible and memorable Halo play ever witnessed, including an epic CTF standoff for the ages in the Relegation Finals between OpTic Gaming and Denial Esports. Led by crowd-favorite up-and-comer Rammy, Denial matched OpTic flag for flag… for three straight deadlocked matches. In the end, OpTic would prove just too much for the talented challengers, but Rammy and his teammates gained an incredible respect from every competitor during their valiant final stand, and in the process would give the teams competing in the Summer Finals themselves a tough act to follow. After some scintillating action on both sides of the bracket – including an epic seven-game series between Enigma6 and Team EnVyUs in the Losers Bracket Finals – the stage was set for the Summer 2016 Grand Finals. If the regular season was anything to go by, then it seemed almost inevitable that things would come down to CLG and E6 – the latter handing CLG their only loss of the Summer 2016 Season. For the CLG, their eventual uncontested roll into the Grand Finals didn’t get off to the most promising of starts, as the defending champs dropped the first two games of their opening series against Cloud9, and we’re precariously close to going down 3-0 before flipping the “okay for real now” switch, rattling off four straight wins to take the series – a precursor performance that would be indicative of the rest of their tournament. For Enigma6, they would open the Finals by dropping their first series to Team EnVyUs 4-2, immediately putting E6 on the back foot. The guys-with-the-eyes would fight back throughout the Losers Bracket, however – eventually exacting their revenge on nV in a fierce Game 7 matchup to earn the right to play CLG in the Grand Finals. In the end, the journey was different, but the destination was the same as the Summer 2016 Season would be drawn to a close in dominant fashion, with CLG completing a dominating 4-0 sweep of E6 to retain their crown as the kings of competitive Halo. Next up, the Fall 2016 Season, where every single HCS Pro League team will be entering with one goal in mind: Take down CLG. 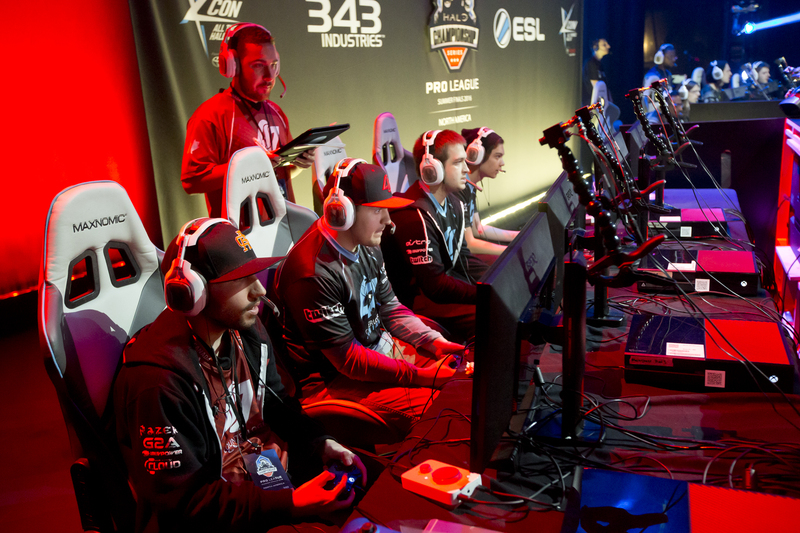 The Summer Finals on the Novo Theatre main stage weren’t the only Halo esports action going on last weekend, as some of the top pro and amateur talent from around the region hit the sticks to prove themselves in the Halo 5 VIP FFA @ LA Live. On the line was share of a $5,000 prize pool and Halo A40 headsets from our partners over at Astro Gaming, not to mention some pretty slick bragging rights. Each round consisted of two heats of FFA Slayer, first on Truth, second on Regret (Mercy wouldn’t return our calls for some reason, despite a flood of attempts), with the top three players from each heat moving on to the next round. After the field was whittled down from over 50 talented competitors, only six Spartans – BabyJ, Daffs, Ferro2Clutch, Kampy, Suspector, and Turley – were left standing. In the Finals, Turley drew first blood by taking the top spot in the first game on Truth, putting up some massive numbers along the way. However, he fell to third in the second match on Regret, leaving the door wide open for BabyJ, who after placing second in the first game, took victory on Regret to secure the tournament title. Big congrats to the winners, and a huge thanks to our partners at Astro Gaming and GAEMS for their involvement and support! Remember, for all updates on the Halo Championship Series, follow @HCS and @ESLHalo on Twitter, and keep it locked to Halo.gg. For this edition of our fiction-focused Fodder feature, we wanted to highlight another top-notch convention experience that has a healthy helping of Halo happenings to get in on. In case you don’t know, Halo isn’t just something to be played on-screen – or only by springing surprise attacks on friends (or co-workers) with BOOMco blasters – it’s also something that you can play around a tabletop. 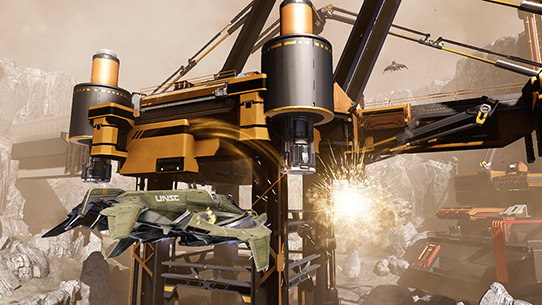 Thanks to our development partners at Spartan Games, Halo: Fleet Battles and Halo: Ground Command are incredible ways to experience large-scale battles in the Halo universe from an entirely new perspective. This weekend, Spartan Games is showing off the latest and greatest offerings in Halo tabletop gaming at the finest tabletop and board gaming convention in the land: Gen Con 2016 in Indianapolis. If you are able to make it to the Gen Con show floor, make sure and check out both the Spartan Games booth (#2756) and TheWarStore.com booth (#2407) for some awesome hands-on Halo like you’ve never seen before. For more details on their show floor schedule and offerings, check out their pre-Gen Con blog here. Of course, one of the awesome perks of releasing sweet new Halo: Fleet Battles and Halo: Ground Command sets is the inclusion of new and intriguing slices of lore that help flesh out the Halo universe in some particularly cool new ways – even within realms you might feel already familiar with. 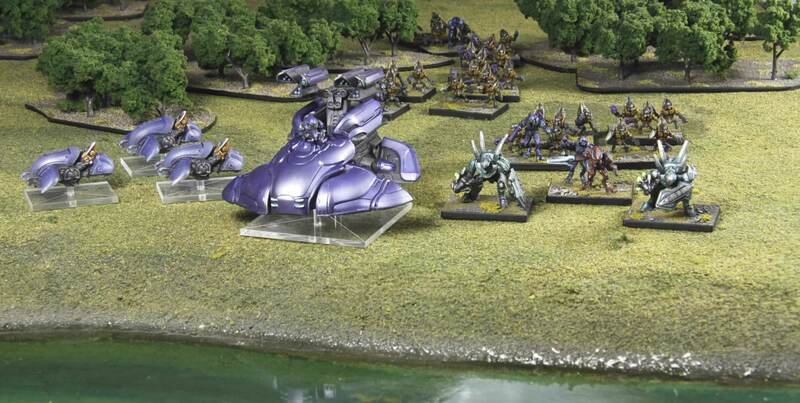 Since Spartan Games is working round the clock to meet the unprecedented demand for new tabletop sets, we thought it would be fun to showcase some of the cool narrative nuggets contained within the newest scenarios’ unit descriptions, along with some additional developer commentary from one of 343’s very own high-level story sorcerers, Kenneth Peters. UNSC Army ground forces are led by seasoned and battle-hardened veterans, who have accumulated many years of combat experience against both human Insurrection forces and the ruthless alien armies of the Covenant. These soldiers are consummate boots-on-the-ground, no-nonsense leaders who do what needs to be done to keep their men alive and complete the mission. Despite the many horrors of combat they have witnessed, UNSC officers are trained to maintain a calm perspective, displaying little emotion, no matter how dire or somber the battlefield situation is. Their role is to inspire their men, and to deliver a sound tactical perspective. They also ensure that combined-arms operations are carried out efficiently and safely by controlling the unit’s shard of the UNSC distributed battle management and communication network (“battlenet”). The core fighting units of the UNSC Army are well-trained, disciplined, and motivated men and women tasked with the defense of the humanity across a myriad of planets and battlefields. It is because of their tenacity that humanity has survived as long as it has against the overwhelming technological and numerical superiority of the Covenant military, and it is on Reach that they will have their finest hour. Riflemen units are equipped with a wide variety of Small Arms (Assault Rifles, Grenade Launchers and Shotguns) but can be reinforced with Heavy Machine Guns or Rocket Launchers. Army Fire Support Teams are allocated as part of their battalions offensive or defensive plans, and their loadout is usually tailored to their mission, terrain, and expected enemy composition. In defensive operations they provide overwatching support-by-fire, while on the offense they engage enemy vehicles and heavy infantry. Spartans are biologically enhanced, cybernetically augmented super-soldiers who wear Mjolnir powered assault amour, which further amplifies their strength, speed, and resilience. While the Spartans were created to deal with colonial unrest, they now stand in the front lines of war against the Covenant as the UNSC’s most elite force. Each Spartan is a hyper-lethal special forces operative, capable of wielding every vehicle and weapon in the Covenant and UNSC armory and committed to the completion of their mission no matter the odds or opposition. The M12 Warthog is a large four-wheel drive all-terrain utility vehicle. Although some Warthogs are used solely for transportation, most are armed and have a multi-mission capability. The standard Warthog offers two seats (driver, side passenger) and a cargo bed for carrying equipment or a turret-mounted weapon system. Variants of the Warthog have been in service with UNSC forces for over two centuries. The most common series within the FAV platform is the M12 Light Reconnaissance Vehicle (LRV) fitted with a pneumatically powered, 360-degree rotation multi-purpose M46 Vulcan Machine Gun. Other major variants include the M12A1 Light Anti-Armor Vehicle which is fitted with a M39 Rocket Turret, M12G armed with a devastating M68 Gauss Cannon, and the M12R ‘Missile Hog,’ which is fitted with the M79 Multiple Launch Rocket System. UNSC Army personnel were typically shuttled to combat zones in conventional transports, but the ubiquitous D77 Pelican was employed when troops and vehicles needed to be moved quickly to combat zones. When prepped for launch a Pelican can load up troops, attach a vehicle to the rear cargo clamp, take off, and deploy its passengers and vehicle at any point on Reach within the hour. Zealots wield both military and religious authority within the Covenant hierarchy, and are ruthless and cruel enforcers of the Prophet’s orthodoxy. Only the most cunning and bloodthirsty warriors are selected for service as a Zealot, and few of those ever openly serve outside the walls of their cloistered chapterhouses and monastery fortresses. Zealots serve the Way and the Path to the exclusion of all else, and their word is law on military campaigns. The Zealot is a force commander and apostle of the Prophets who leads Covenant forces in times of war. Zealots do not simply command. They are war priests and dervishes who inspire as much as they direct, and their order is held in awe by many within the Covenant. Grunt is the human name for the low-ranking, xeno-arthropodic Unggoy who form the bulk of the Covenant ground forces. Indoctrinated to deluge their enemies in bodies and blood, the Grunts are considered to be disposable assets by their commanders, though they are rarely expended without good cause. Vast numbers of ill-trained Levies are used for front-line combat as well as various menial roles in the invasion, organized into Lances (analogous to squads) under the command of an Elite overseer. Young Sangheili warriors are ever-hungry for glory and accumulation of battle honors that will enable them to advance in the bloody meritocracy of the Covenant. It as Minors that the warrior’s battle lust is tempered by the realities of war and they learn the merits of teamwork, though these lessons are hard-earned by impetuous and overconfident recruits’ eager to show their worth. Those Minors who show an affinity for leadership are placed in command of lower-caste Covenant forces, while those with more bravery than skill are kept under the watchful eye of experienced Sangheili Majors. Hunter is the human name for the combat form of an exotic alien species known as Lekgolo. Hunters are actually composed of eel-like creatures (though often called “worms” by UNSC personnel) bound in an armored shell. In Hunter form, the gestalt intelligence created by the Lekgolo is fairly intelligent and has an impressive capacity for tactics, though by nature they generally disregard the presence of other Covenant when engaging in combat. Hunters are deployed as bonded pairs on the battlefield – each forming one half of an independent colony. The death of one Hunter will drive its surviving partner into a berserk rage. Floating on a cushion of gravitic energy, the Ghost is a one-man all-terrain bike with a ubiquitous presence in all Covenant military actions. The Covenant use the Ghost primarily as a scout and raider, sending it behind enemy lines to track and hinder an adversary’s movement. Particularly daring operators use the Ghost to directly engage enemy infantry and light combat vehicles (such as the human’s Warthog). The Phantom’s sleek silhouette and sinuous design is imprinted in the minds of most UNSC military veterans. Agile and heavily armed, the Phantom is a versatile assault dropship used to ferry troops, armored vehicles, and pre-fabricated fortifications from staging areas and carriers directly to the battlefield. Each Phantom is armed with a heavy plasma cannon turret installed on an armature located beneath the cockpit and two smaller plasma cannon door-guns on the sides. 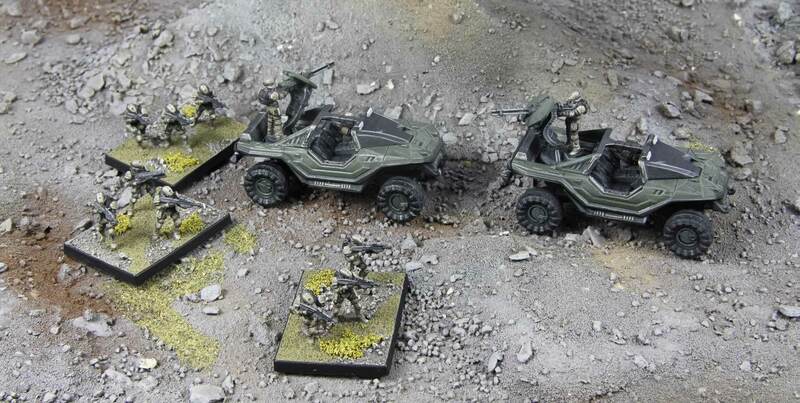 If you are interested in Halo tabletop gaming and are looking to catch up on some of Spartan Games other Halo projects, check out some of these previous issue of Canon Fodder for more info! As a friendly reminder, time is running out on your chance to get in on the Halo Legendary Crate: Founders Edition. Every Halo Legendary Crate will be filled with items specifically tailored to provide and awesome and exclusive Halo experience, and you only have until Aug 14 to call dibs on the Founders Edition crate. Be among the very first Spartans to join Fireteam Apollo and get your swag on! That will do it for me, folks – but I leave the rest of this update in the capable hands of Brevet and Uny. Until next time… Live well, play Halo, and for Fodder fans in Italia, head over to our friends at HaloWorld.it conoscere meglio il mio esperienza in 343 Industries. Infinity Siege is a symmetrical space combat map with two Unsc Infinity ships fighting each other. You fight each other flying the Wasps. The map has 3 different tiers with different objectives. Tier 1: Blow up the fuel silos. Tier 2: Take out the shield generators. Tier 3: Board the enemy ship and destroy the core. Infinity Siege has been in development for about 2 months, but it’s something I’ve wanted to make ever since Halo 3. 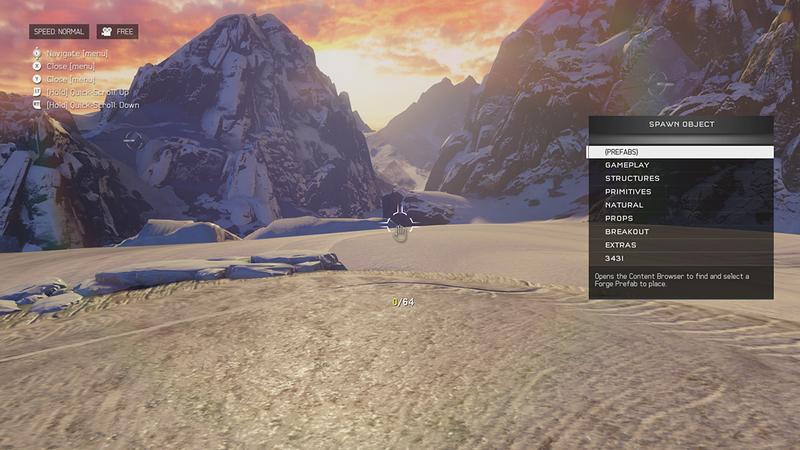 It is really awesome that we can finally do crazy things like this in forge! Grab the map here, the mode here, and check it out on ForgeHub here. Thanks, Grim. This week, Uny spotted two plays of the week that apparently tickled his fancy. Avoiding any additional details at all costs, I simply grabbed the clips from him. The first clip comes from TooToasty, who plays some fine, fine defense. Watch it here! Clip #2 comes from SilverShooter99, who gets clutch when the going gets tough. Keep an eye on the score.